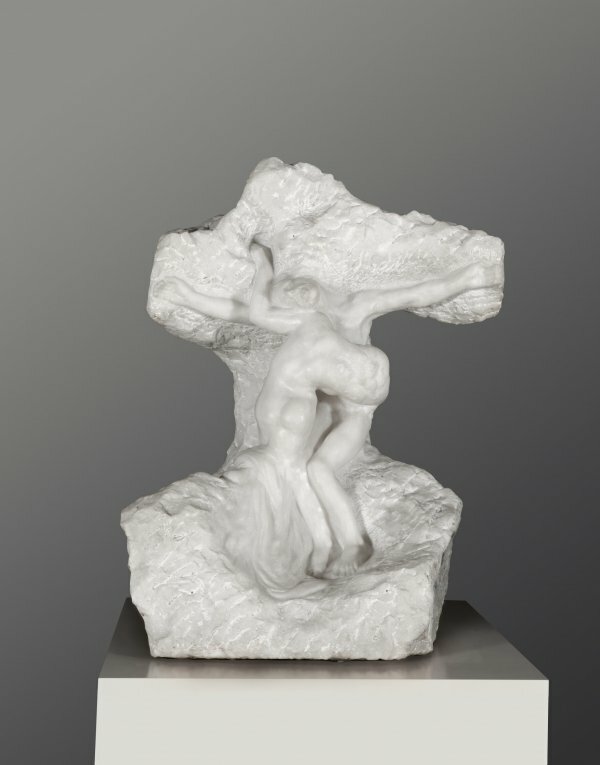 Christ and the Magdalen is the only known work by Rodin on a religious subject. Various elements, however, suggest that it is in fact a depiction of the typically Romantic theme of the unacknowledged genius. Firstly, its original plaster cast dates from the mid-1890s, to the same period as Rodin’s rejected Balzac monument. Secondly, this work has been given a number of titles in the past, including The Genius and Pity, and Prometheus and an Oceanid. 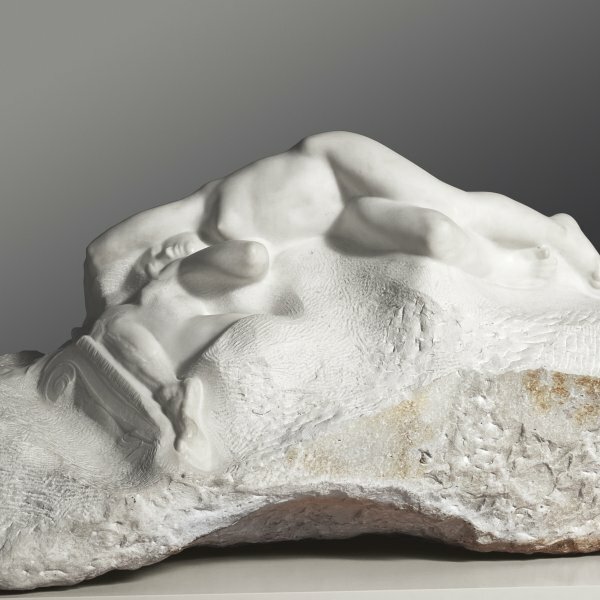 Whatever the case, Rodin created this sculpture by combining two earlier works. The figure of the crucified Christ is based on a number of medieval sculptures, some of them owned by the artist himself, while Mary Magdalen looks to Rodin’s figure of Meditation that he designed for the Gate of Hell. The bodies of the two figures are intertwined, standing out against the base of unpolished marble in a manner reminiscent of Michelangelo. Although the inventories that Rodin left behind refer to about a dozen Christs-including the large Italian Christ that hung in his room in Meudon-and although we know that he particularly admired the ascetic Christ in Perpignan cathedral and the Santísimo in Burgos, Christ and the Magdalen is the only surviving testimony of a work of religious inspiration. According to Judith Cladel it was not the first Christ that Rodin executed, but it is the only one to survive today. The execution of this marble was undoubtedly started before August Thyssen commissioned it. In his work on Rodin published in 1898, Maillard dates the plaster to 1894 and it is even possible that it dates from the mid-1890s. This is confirmed for example, in a letter from a female admirer dating from these years which refers to the statue Balzac (commissioned in 1891, exhibited at the 1898 Salon): "Is Balzac advancing well?" Berthe Dumon asked Rodin. "Did you make the Christ on the column and have you transmitted all that you wanted to through it?" With regard to the marble, the first documented record of the work is the publication in 1905 of a photograph of the group in the Thyssen Collection, which was by then in an advanced stage of completion. 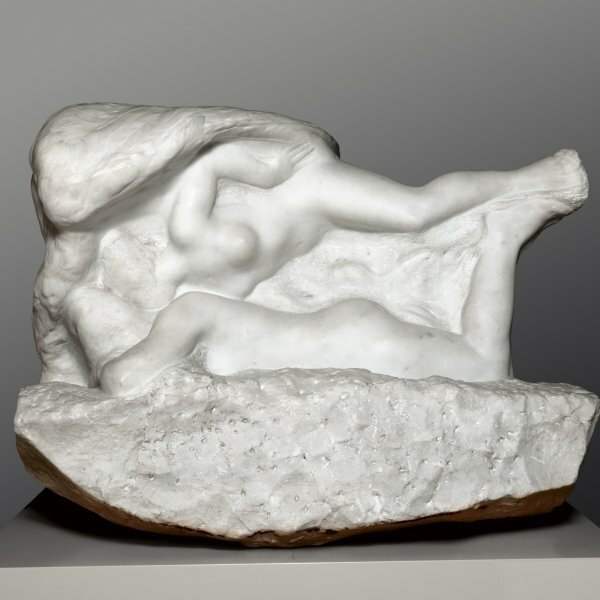 In Christ and the Magdalen, Rodin appears as the successor to the artists of the Romantic generation. "I had confessed, " Berthe Dumon wrote, "a sympathy (to the group) equal to that which I feel for La Destinée, the eloquent story of a brilliant man who is ridiculed more as his ideas become truer and more just; today's pillory will become tomorrow's triumphant altar, even if during his lifetime he will often only be understood by a compassionate woman." This parallel between Christ and the genius misunderstood by his contemporaries -one of the Romantics' preferred themes-is confirmed by titles like The Genius and Compassion or Prometheus and a Sea Nymph that were sometimes given to the work according to Grappe. Rodin seems to have been fascinated by the myth of Prometheus with which artists in the 19th century often identified (in a similar way to Christ in the Symbolist period). In fact, at the beginning of the 1890s Rodin experienced several professional and personal difficulties: while he started his liaison with Camille Claudel, The Bourgeois of Calais was still on the point of being installed, and the Monument to Victor Hugo and Claude Lorrain were severely criticised and had to be changed. The harshest blow, however, came after the scandal caused by the presentation of Balzac at the 1898 Salon, when the Society of Men of Letters rejected the sculpture it had commissioned. In order to help him overcome this ordeal, Rodin's friends encouraged him to go back to previous works, including the Gates of Hell. It is more than likely that was at this moment that he decided to have Christ and the Magdalen, a work with a mould that was a few years old, translated into marble? "The artist, " he confided to Gsell, "sometimes has a tortured heart. In everything he sees he clearly captures the intentions of destiny. He enthusiastically fixes his vision on his own anxiety and his most severe wounds like a man who has foretold the dictates of fortune." It is perhaps this special link with its creator which explains why Christ and the Magdalen was never exhibited during the artist's life, while the numerous photographs that exist of it (by Druet, Bulloz, Vizzavona, Choumoff) and the admiring comments it provoked from those who saw it, are an indication of the reception it might have had at the end of the century, a period favourable to Symbolism. The plaster mould was not presented at the 1900 exhibition; the two marbles quickly entered private collections from which they did not emerge again. Whether unintentionally or deliberately on Rodin's part, few works of this importance remained in such obscurity. In the meantime, the moulds for the marble of the Thyssen Collection were made and it is through these that the group became famous after Rodin's death.